Grilling season is well under way, and if you’ve gone through all of your tried and true BBQ recipes, you may be hitting the mid-summer menu doldrums. 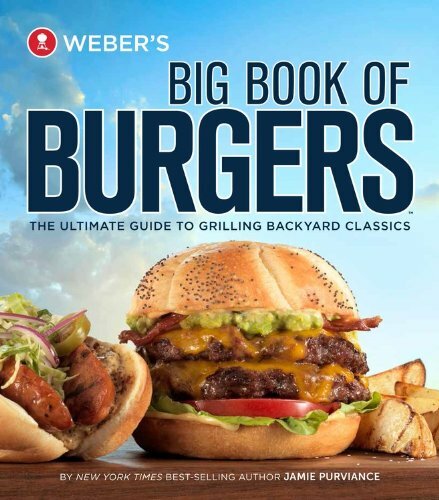 If so, one of the easiest ways to add a little interest to your grilling repertoire is to put a spin on one of summer’s classic dishes, the hamburger. For a new twist on this backyard mainstay, change up the standard ground beef with lamb, turkey, salmon, or veggie patties, like these homemade vegetarian Sweet Potato Coconut Patties. 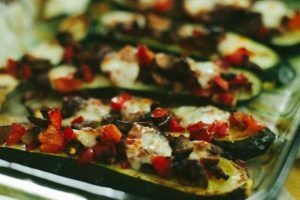 Go with a regional flavor theme like Greek or Asian, and switch up the veggies, cheese and condiments to suit – try tinkering with every element, or only a few. 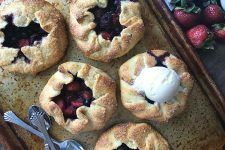 If you usually have a bun, go openface on a bed of salad instead, or try an artisan roll, homemade pita pocket, or naan for a different taste and texture. 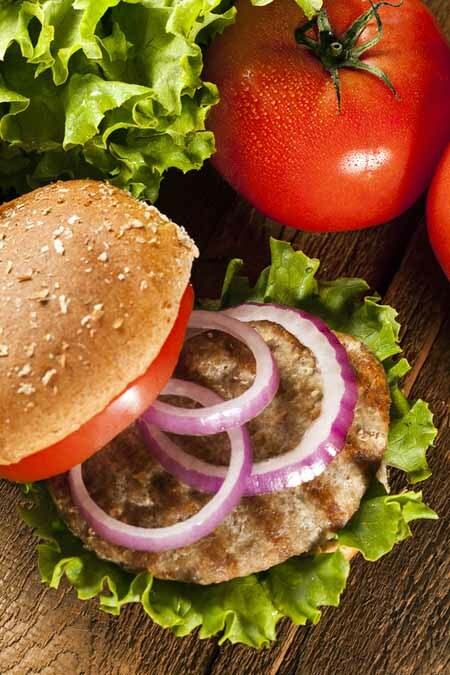 Before we launch into the burger ideas, let’s have a look at comparative nutritional values of the different types of patties so you can tailor your selection to best suit your dietary needs. Looking for something a little different? 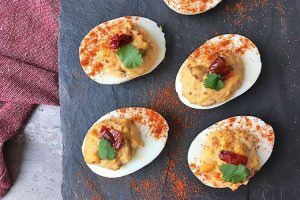 Try an over easy egg to replace the usual condiments. • Ground Lamb comes in at 240 calories, 23% total fat with 9 grams of saturated fat. • Ground Chuck has 209 calories, 20% total fat with 5 grams of saturated fat. • Ground Turkey has 193 calories with 13% total fat and 3 grams of saturated fat. • Ground Grass-fed Bison will have 124 calories with 3% total fat and 2.5 grams of saturated fat. • Ground Lean Sirloin has 140 calories, 5% total fat and 2 grams of saturated fat. • Ground Salmon has 130 calories with 4% total fat and 0-1 grams of saturated fat. • Ground Turkey Breast has only 91 calories, 1% total fat and .5 grams of saturated fat. • Veggie Patties have between 90 and 150 calories, and 0-1 grams of fat. • Soy Crumbles come in at 60-90 calories, 5% total fat and 0 grams of saturated fat. 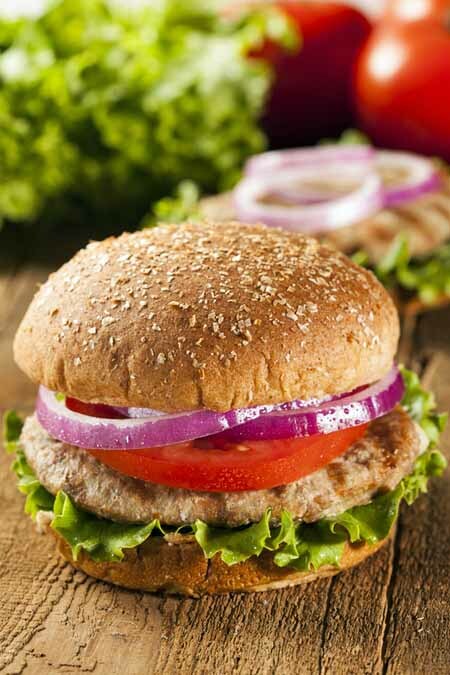 Try the following tips for making delicious, moist hamburgers regardless of the type of protein used. For juicy burgers, make patties at least 1” thick. This is to allow the outside to form a crust from the heat of the fire without drying out the internal moisture. To bring out the best flavor, season with salt just before grilling. Adding it too soon will draw out the juices, drying out the patty. Season generously with salt and pepper on both sides, then sear over high heat (375-400 F) before reducing heat, or moving to a cooler section of the grate to cook (325-350 F). The high heat reacts with the salt to form a delicious, amber-colored crust that seals in the meat’s juices. Don’t press the patties– art takes time! When grilling, don’t press with a spatula as this only presses out the juices, leaving you with the dreaded dry patties. And no poking either. Poking with a fork also releases juices, so you should look at the juices on top of the patties instead to test for doneness. When they first start to seep out onto the top and still have a hint of pink, they’re at about medium. When the juices are clear, the meat will be medium-well. And when they become opaque, the patties are well done. Although not necessary, it’s helpful to chill patties in the fridge for an hour before grilling, to allow them to firm up so they’ll hold their shape on the grill better. Salmon or crab patties, and any recipes that call for extra liquid, can be a bit fragile. To create a firmer texture, chill patties in the fridge for at least half an hour. Turkey must be cooked thoroughly, until the center is no longer pink. Remove from the grill as soon as turkey burgers are done, and serve with creamy condiments like cranberry or sage aioli to counteract any dryness brought about by the very lean nature of this meat. After an initial, brief sear on high heat to seal in juices, meat-based burgers should be cooked over medium heat (325-350 F) until done. This is the healthiest grilling method as it will minimize the health risks of charring and smoke residue created from dripping animal fats grilled at high heat. As with seafood burgers, chill veggie patties for at least half an hour after forming to help them hold together on the grill. A “vegetable grilling basket” is a useful accessory for barbecuing veg burgers (and seafood patties) as they have smaller holes than the average grill rack. Professional chefs recommend mixing the meat and forming patties with the hands, and that hands should be cold and wet from running under cold water. Mix and form burgers with a light, quick and chilled hand to keep the meat as cold and tender as possible. 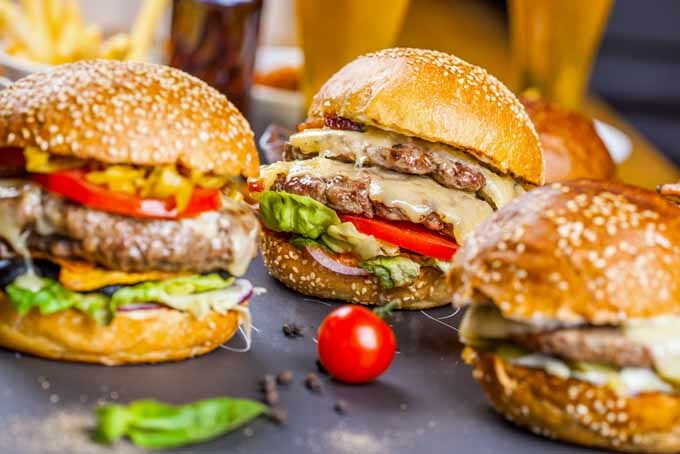 Selecting the toppings that create a great tasting burger is similar to making any sandwich, and works best if the flavors are contained within a theme to maintain integrity. Complementary or contrasting tastes and textures should always follow the lead flavor of the meat or other protein, and should support the dominant taste. Two or three flavors and textures produce a well-balanced burger and can be further enhanced with a couple of intensive flavors. Add intensive flavor in the form of cheese, relish, pickles, chutney, tapenade and condiments to add a prominent edge of flavor without overpowering the rest. And to avoid bland burgers, stay away from doubling up on toppings of a similar texture or flavor – they’ll need another element to complement or contrast with in order to add interest. If you’re committed to ground beef for your hamburgers, try a combination of cuts for the juiciest and most flavorful burgers. Freshly ground meat from your butcher is preferable, but prepackaged meat from the grocery store is fine as well. Regular ground beef is a “no-name” or generic category that can be made up of a number of different cuts, or from only one source, and may contain as much as 30% fat. While a bit of fat in the mix adds depth of flavor, a high percentage will make the burgers overly greasy and increases the chance of flare-ups on the grill. 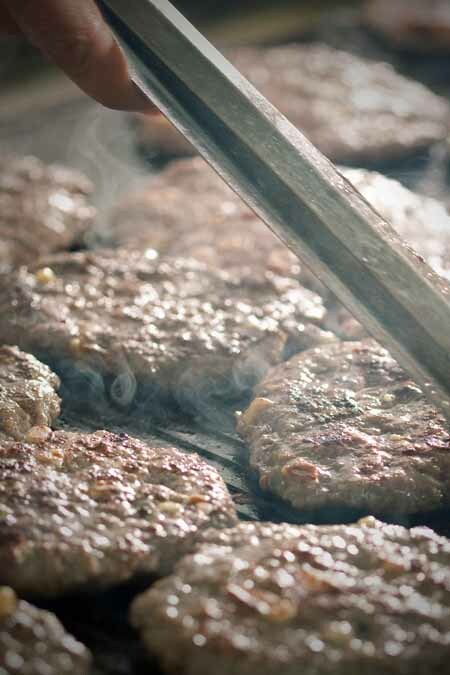 Flare-ups from animal fats cause charring and leave a smokey residue, which has been linked to numerous health concerns – choose a leaner percentage of fat-to-meat for healthier grilling. Ground chuck has about 20% fat, and while it’s full of flavor, this percentage of fat is still relatively high. This selection works very nicely when mixed half and half with lean ground sirloin – it’s full of flavor and has a lower fat count at approximately 17.5%. Ground sirloin is a lean choice at about 15% fat, and it mixes well with ground chuck for lean burgers with flavor and panache. 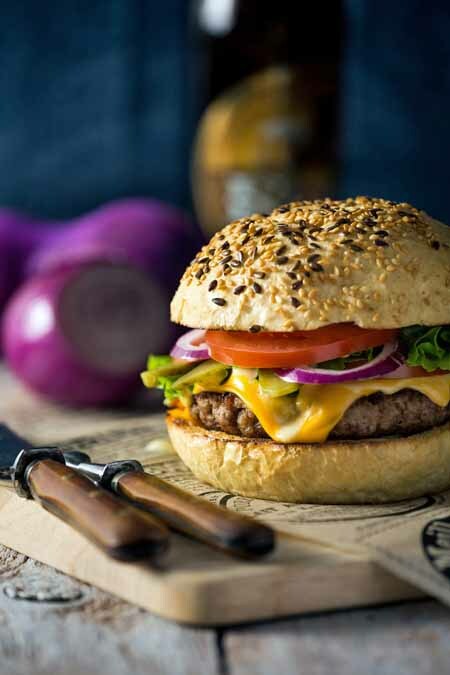 Ground round has a low fat percentage of approximately 11%, which makes it a very lean choice for burgers. However, because of the low fat count the cooked patties can be somewhat on the dry side. Mix with ground chuck to increase the fat content and juices, or add some flavorful liquid to the meat when making patties. Ground beef mixtures are nicely enhanced with Dijon mustard, Worcestershire sauce, Sriracha sauce, steak sauce, or a splash of red wine. The herbs and spices that make a good complement to beef burgers are parsley, basil, thyme, oregano, marjoram, savory, garlic, and chili flakes or powder. For intensifying flavor, try using dill pickles, sweet relish, capers, anchovies or chutney, plus almost any cheese will serve a beef burger well. For the true fromage fancier, try a combination of sharp cheeses to bring out the best flavor in the beef – red Leicester, extra-aged Cheddar and Roquefort create an amazing flavor combination. And of course, beef can be dressed with any raw or grilled veggies and fruit, and your bun of choice. 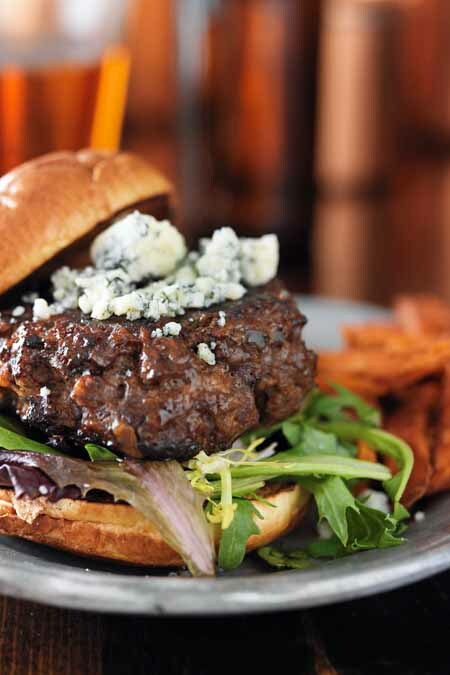 For a foray into flavor heaven, try out this Oozy Bluesy Stilton and Sirloin Burger. These burgers have robust flavor and a fine, lean texture due to the combination of two types of ground beef. 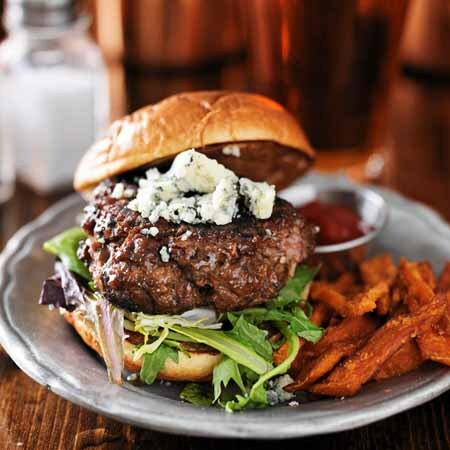 The red wine adds a lovely depth of taste of these burgers and is perfectly complemented by the blue cheese. Serve open face or on crusty rolls with your favorite toppings, a side of sweet potato fries, and a well-chilled beer– perfect summer fare for any fan of beef burgers. In a large mixing bowl, whisk together the egg, garlic, Worcestershire sauce, 2 tablespoons wine, mustard, parsley, basil and pepper. Add the ground sirloin and chuck and mix together well with your hands. If the mixture seems too dry, add the last 1 or 2 tablespoons of wine. Divide the meat and form into 6 – 8 patties. 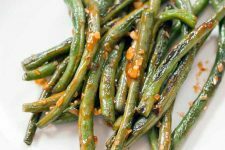 Season both sides well with salt and pepper, then sear quickly over high heat, 375 – 400 F.
Move to a cooler spot on the grill and cook over medium high, 325 – 350 F, for 4 -5 minutes per side. Add a glaze of barbeque sauce after they’ve been turned, if desired. Add the blue cheese during the last minute of cooking until it just begins to melt. Remove from heat and dish up hot from the grill. Looking for a press to smash your garlic? Check out Foodal's Guide to Garlic Presses now. Ground turkey (a mixture of dark and white meat) and ground turkey breast are very lean options for the grill, ideal for those who are counting calories or tracking cholesterol levels. But because of its lean nature, the final product can be a bit on the dry side and it definitely benefits from being mixed with some liquids. For 2 pounds of ground turkey, add 1 tablespoon each of Worcestershire sauce, Dijon mustard, and white wine. Add 1 teaspoon each of fresh minced sage, thyme and rosemary, 1 teaspoon of garlic powder, and ½ cup of ricotta cheese. Form patties, refrigerate for at least 1/2 an hour, and season both sides with sea salt and freshly ground pepper just before grilling. 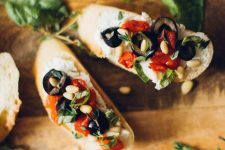 Add a milder cheese such as Swiss, pepper jack or caraway Edam and serve on a crusty roll – a Portuguese bun or ciabatta roll works nicely. Dress with thinly sliced tomato, butter lettuce, sweet onion rings and a creamy condiment like cranberry aioli, Dijon mustard or a good mayonnaise. Lamb does have a high fat content, but its incredible, rich flavor makes the occasional indulgence worthwhile. Sear patties on high heat after seasoning with salt and pepper. Then, to keep dripping fat and flare-ups to a minimum, reduce to medium heat until done. Lamb is complemented by herbs such as oregano, dill, basil and mint, and a hint of crushed red pepper and lemon zest works well too. Brush some pita bread with olive oil and warm on the grill. Dress the pita with sliced tomato and sweet onion, spinach or other leafy greens, and finish with a tangy goat cheese or feta mixed with tzatziki for some sharp flavors to complement the sweet lamb. 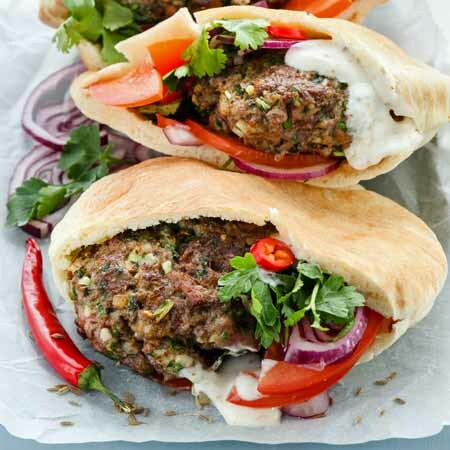 For an extra flavor burst, spread the pita with olive tapenade – and check out this awesome recipe for Zesty Lamb Burgers with Fetziki Sauce. Serve on whole wheat pitas or seeded hamburger buns with Fetziki Sauce, sliced beefsteak tomatoes, grilled slices of red onion and fresh baby spinach. And an ice cold glass of retsina. Heat a skillet to medium high and coat with olive oil. Sauté the onions for 3 – 4 minutes, then add the garlic, season with the salt and chili powder and sauté for another 2 – 3 minutes. Remove from heat and allow to cool. 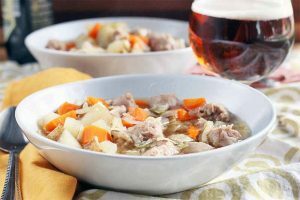 In a large mixing bowl, combine the lamb, cooled onions, oregano, thyme, mint, parsley, cumin, coriander, paprika, cinnamon, lemon zest and wine or apple juice. Combine all ingredients quickly, mixing well. Form the lamb into 6 equal patties and sprinkle both sides generously with salt and pepper. Quickly sear the burgers over high heat, 375 – 400 F, then move to a cooler spot on the grill and cook over medium high, 325 – 350 F, until done. 4 to 5 minutes per side will come out medium-rare, so adjust time accordingly to suit. Remove burgers from the grill and let rest for 3 to 4 minutes. Cut the pitas in half. Smear each half generously with the Fetziki Spread. Top one half with a burger, then tomatoes, sliced onions and spinach. Place the other pita half on top. Combine the yogurt, feta, vinegar, garlic, mint, dill and cucumbers. Season with salt. Let sit for at least 1 hour at room temperature before serving. *If you don't have a good zesting tool, check out Foodal's guide for the top rated models today. 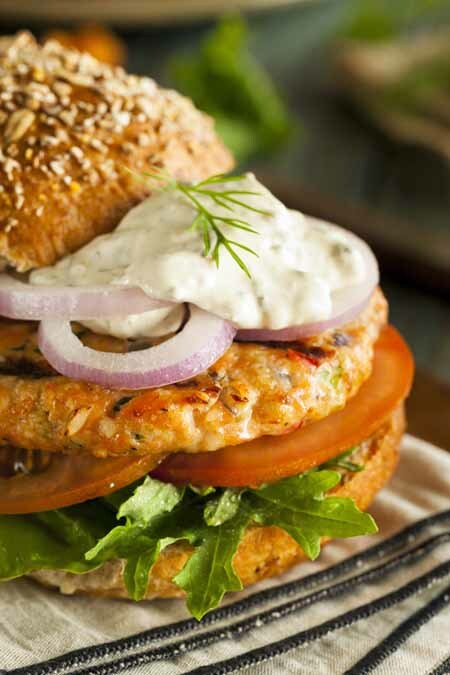 Salmon is an excellent source of lean protein and contains all of those wonderful omega-3 fatty acids that are so good for our heart and brain health – so learning how to create a good salmon patty is well worth the effort. Which isn’t much. Because of its lean flesh, ground salmon doesn’t cling to itself in the same manner as other meats will, so the use of a binder is recommended. For a binding agent try using egg, white or panko breadcrumbs, or a current favorite, quinoa. Add in a splash of white wine, herbs, spices and seasonings and form into patties, then chill in the fridge for an hour or so before grilling. Salmon goes well with a number of aromatics, herbs and spices including dill, parsley, basil, savory, shallots, tarragon, chives and garlic, as well as lemon zest, lemongrass, and ginger. Salmon is suited to a variety of condiments such as homemade tartar sauce, chimichurri, and tomato relish and they’re delicious served with a few crispy Yum-Yum Pickles. One of our favorite condiments for this lean fish: a mean green goddess dressing, drizzled atop your salmon patties. 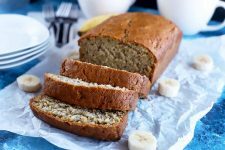 Check out the recipe and give it a try…it’s delicious! Try a salmon burger without a bun, and dress it on a bed of mixed greens with pear, pecans and gorgonzola cheese for some sharp flavor highlights. 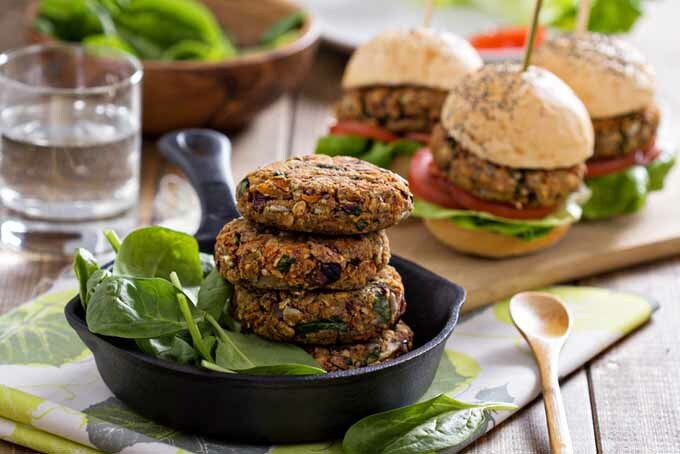 Veggie burgers work very well on the barbeque and are easy to make – a delicious, healthy alternative for a meatless barbeque. A bit more prep time is required for these than other burgers, so double up your recipe and freeze some patties for later. 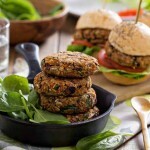 Look for veggie burger recipes that have a good source of protein and enough moisture to keep them juicy on the grill. Mash together the chickpeas, white beans and black beans along with the sautéed vegetable mixture. Add in the cooked quinoa and seasonings to tastes. Mix well and then add the beaten egg and panko crumbs and continue to until all ingredients and incorporated. Form into patties and chill for an hour to firm up. Serve on a soft, multi grain bun with caramelized onions, roasted red peppers and soft goat cheese for a flavorful and healthy burger. *Use a full 8 ounce can for each of the beans and double the rest of the ingredients if you’re doubling up for the freezer. ** I’d suggest a mixture of such as onions, garlic, peppers, chili peppers, celery and artichoke. *** Seasonings to taste. Let your imagination run. I like a blend such as paprika, cumin, chili flakes, sage, various natural salts and pepper. And that closes the lid on our look at different burger ideas for your summer grilling pleasure. Be adventurous and try one, or all of them… you never know when you might find a new flavor favorite for this popular classic. OMG, I’m telling you. Thanks for the bean recipe. You can never have enough of those. I’m looking at all these pics and you know you are becoming a real vegetarian when you start to look at beef differently. First I see that Wendy’s or Carl’s Jr. commercial with Paris Hilton biting a huge burger and then I see the real cow that it use to be like a flash. I’m like on the boarder of the vegetarian thins. I still find a burger like that enticing. It reminds me of the cigarette smoker who says they still have the urge to smoke. I’m not going to get into all the reasons why I’m going from a meat eater to a vegetarian. I feel no hate for it, I still love the idea of all of it. I just researched it and was completely convinced by what I found. Ok, back to these recipes. Let’s see, the vegetarian one is really nice. A mixture of three different beans. Three Bean Patty, like three bean salad. Panko crumbs, I can’t seem to find exactly what is in that. I guess it is just dried bread. Ok it is from a soda cracker or oyster cracker something like this. They do make a gluten free one. I do a lot of just real foods. I’m going to have to look up what is a replacement for bread crumbs. It’s kind of cool once you start to find these things. I’m guessing it could be cauliflower & chia seeds. The egg and the cooked veggies. I would do raw vegetables. Vegan egg replacement maybe, it’s not necessarily real though. A real vegetarian does not do dairy. It’s about kindness to the animals and digestion. I’m trying and certain things are still appealing. The salmon and turkey variations. My friend is going to love those. I might even tend to use the Salmon as a back up. A lot of people only eat fish the only trouble is the mercury. There is no way for them to regulate it. Fresh farm ground turkey is the best way on that. No hormones or steroids. The big one is you don’t want any animal bi-products in your ground meat. What is in that will make your head spin. The sirloin version. I might try the mixings of that with the veggie patty. Why are we so fascinated with burgers? Which ever one you choose the whole thing can be very satisfying. If you are dieting I prefer to toss the bread and just put it in a salad chopped up. Maybe a brown rice bread or a tapioca bread will digest well. A regular bun with meat is really hard to digest properly. I found a huge difference with the tapioca bread. It keeps the tummy flat. In any case, all these sandwiches look good. Being a non-red-meat-eater, I always appreciate finding recipes and ideas for alternative patties. 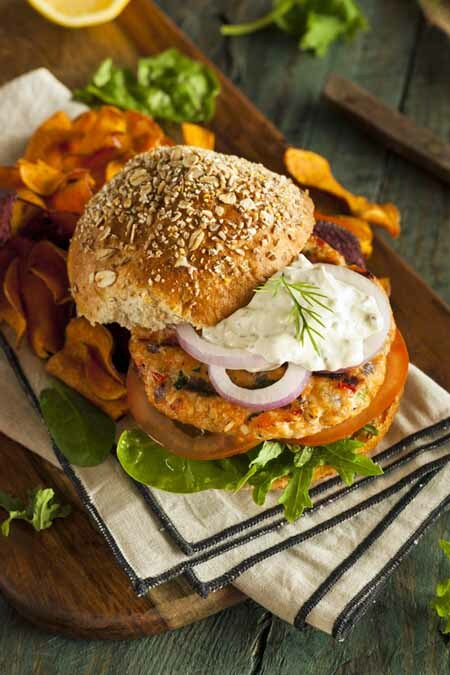 Salmon burgers are especially enticing, more so with all those herb pairing ideas! Will definitely have to try out that bean recipe well; I’ve done patties with just black beans so this variation will be a nice switch-up. The combo of the beans is nice Leopard, and the quinoa adds a nice touch too. Enjoy! I would eat any of the burgers pictured,they all look delicious. I’m particularly drawn to the beef, lamb, and veggie burgers described in the article. I wonder if some stores sell a veggie mix the way most grocery stores sell ground beef? That would definitely increase the likelihood that I’d eat veggie burgers. I don’t get lamb often, and have never tried making lamb burgers, but I love it, and it sounds wonderful, paired with the condiments and toppings you’ve described. They’re all pretty tasty Diane. Try Whole Foods for ‘ground veggie meat’… I know pre-made veggie patties are available from health foods stores through to Walmart, just check the labels to ensure you pick the healthiest. Many grocery stores will sell veggie burger patties — and some of them are quite good. But I’ve yet to see some veggie mix to assemble ourselves! What mouthwatering images! The egg on top of the other condiments looks delicious (and it would make for a nice extra boost of protein). Makes me want to get my grill out right now! Thanks for the tip about avoiding pressing the patties. I do get dry burgers sometimes and now I know why- I’m being too attentive, I guess. Too attentive or too eager … sometimes it’s hard to wait when you’re hungry! I’m grateful for the veggie recipe too. 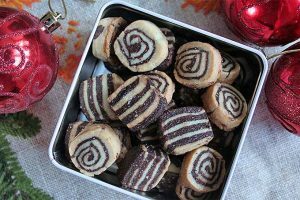 These look so cheap to make from scratch, especially compared to the shop-bought goods. These would be just the ticket to serve to vegetarian guests. Thanks very much! 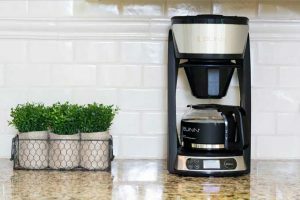 They’re tasty and budget friendly too… and they freeze really well, so double up the recipe for even more savings. I love the idea of a salmon burger, although it would be pretty far from my usual. Usually I use either turkey or beef without any more complicated substitutes. But I’m more stunned by the idea of putting an over easy egg on a patty. Perhaps I’m a little simplistic, but most of these recipes seem too complicated for me. I wouldn’t own half of the ingredients, unfortunately. But using an egg as a topping would be simple enough and it sounds like it would taste great. The egg topping is popular with the Brits, and works well with a creamy cheese like Brie or Camembert. I love how you took out the time to include the nutritional values for each burger type. A lot of food sites I’ve visited have a low-calorie section but don’t give any calorie counts (which seems so contradictory to me). I’m not exactly on a diet, but if I’m making a meal for someone that’s trying to watch their figure then this is vital information. Other than that, these recipes look fantastic. I plan on trying the sirloin burger recipe, but I’m going to tune down the measurements so I can make them into mini sliders. Thanks for your comments guruproto, a little information can go a long way for those with dietary restrictions. I’ve never actually scaled the Stilton Sirloin recipe down to slider size, but they would be awesome – let us know how they turn out for you. Look at all those juicy hamburgers! I’ve never thought of using seafood in such a way. See if I was able to cook like this, something as simple as a sandwich would be so fun to make and eat since we eat with our eyes as well. I’m not the type of person to prepare burgers at home since I can never get them to taste as good as the one they prepare at fast food but I think I didn’t have the right resources and recipes. 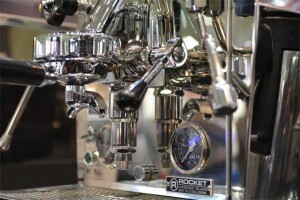 Thanks to this article I’ll give it a try and hopefully I get it right this time! 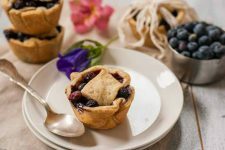 It might take a little experimenting to get them just right for your tastes fuzyon, but the health benefits of controlling the ingredients in your personalized recipe is worth the effort. Great ideas! My mom still insists on cooking burgers the exact same way every time because it’s the way she’s always done them. Recently, I started mixing 2/3 ground beef and 1/3 chorizo with some extra paprika and cayenne into my patties. Her and my step-dad loved them! Every time I make patties for the grill, that’s what they ask for. However, my mom still makes hers with only ground beef and salt and pepper. When I ask her why, she just shrugs and says it’s easy and she doesn’t think about it. I’ll keep playing with mine though! It’s easy to get stuck in a rut in the kitchen zeedame, but it sounds like your chorizo burgers have a little jump to them! Will have to give your mix a try. Thank you so much for the veggie burger recipe! I’ve been searching for a good bean burger recipe for a while now, and the bountiful bean burger recipe sounds delectable. Being vegetarian means that you have to search high and low if you want to buy ready-made burgers in the frozen food section, so it’s always best to make them for yourself. Another thing I like a lot about this article is the inclusion of nutritional values, and I was surprised by how healthy the veggie burger is! Thanks again for this great recipe. Glad you found the post helpful turtledove… you’re right, if you want lean and low cal, the veggie patty’s the way to go. Hope you enjoy the recipe. Every week their is a new fast food chain popping up, trying to make a buck from basically all the ideas you posted here! I love that I can do all this at home and not spend big. As with the other posters, love the bean based recipe! So so so much better than any other veggie burger! 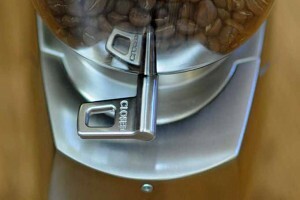 Thanks jony, there’s not doubt at home’s the best for flavor, health and economy… glad you liked the bean based recipe. Black bean burgers are also a great alternative. This seems to be a hot trend right now and I will say I was very reluctant to try them because I don’t always follow those trends. 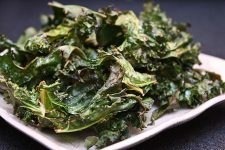 I remember about 10 years ago when kale started to become the thing, I was not happy with it at all. I know it has wonderful health benefits but I can’t get past the taste. This was not the case with patties made from black beans. I was pleasantly surprised that they had a nice flavor AND are healthy as well. Flavorful and healthy… hard to beat that combo. They all look so delicious! The funny part is that me and the hubs were just talking about spicing things up food wise. We’ve become very bored with everything, so it’s safe to say your burger ideas couldn’t have come at a better time. Typically we go for the regular ground beef or even freezer brands, but never have we tried lamb. I don’t think I’ve even had lamb before so I’m particularly interested in that one. Plus we always seem to run into the dryness problem. It never dawned on us that possibly poking into the burger was the problem. It just never felt right watching the color of the juice. I like being thoroughly and that just didn’t seem thorough to me. However, I know different now and thank you for the tips and new ideas! Wonderful article. Glad you enjoyed the post denelizr. Watching the juices for done-ness is an exercise in patience to be sure! It’s so much easier to poke or break a patty open a bit… but waiting does pay off with juicier burgers. If I choose to change up my traditional hamburger, I typically go for the leaner turkey patty. However, I’m guilty of otherwise conforming to the traditional hamburger. 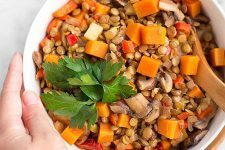 I would love to try it with lamb as I know that my local Middle Eastern grocery store carries it, but I’ll definitely be using the bean recipe for my vegetarian roommate. Thank you for the article! 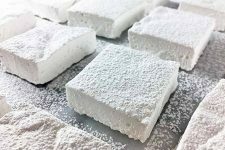 A good Middle Eastern grocery store is a treasure Liv… hope you enjoy the recipes and thanks for your comments. I don’t know of anything else screams summer more than burgers. And what great timing, this is actually on our dinner menu for tonight! 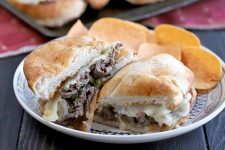 I have to say, I am definitely guilty for poking the meat and squeezing the beef; I’ve always wondered why these yummy sandwiches always turn out a little dry, but now I know! And all those flavor combinations? Double yum! My husband and I don’t usually deviate from your typical salt and pepper, and if we’re feeling adventurous we may add some other spices or tabasco sauce or something. 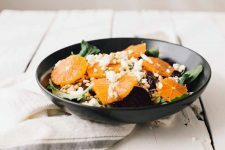 However, after reading this article I should seriously consider adding a bit of feta or bleu cheese to our dinner, and maybe even some sort of vegetable other than lettuce! Thanks a million for the inspiration! You’re welcome tangela, I hope a slice of bleu finds its way onto your meals! When I first saw this post it all felt like burger blasphemy – to me, hamburgers should always be beef. But because all of your pictures and recipes looked absolutely amazing, I decided to try one of the recipes. I tried the turkey variety and it was so so so so good!! It was probably the most enjoyable treat I’ve had in a while. Where was this article when I first bought my grill?! Seriously, though, I love how comprehensive and thorough this is. I am just starting to branch out into my own style of cooking, separate from my mom’s, and I’m in that fun experimentation phase. I can’t wait to try some of these. I remember trying to make bean burgers the first time I moved out and lived on my own…didn’t turn out so well. This recipe looks delicious, though! I had no idea about the salt, either! I’ve always pre-seasoned my patties well before actually putting them on the grill. Interested to see how this change improves my burgers. Thanks for this quality post. It’s nice to see an article with a little meat to it (hahaha…anyone?). Hahaha… got it and appreciated! Have fun with the recipes and your experiments cinnajinx. Glad you found the post useful. 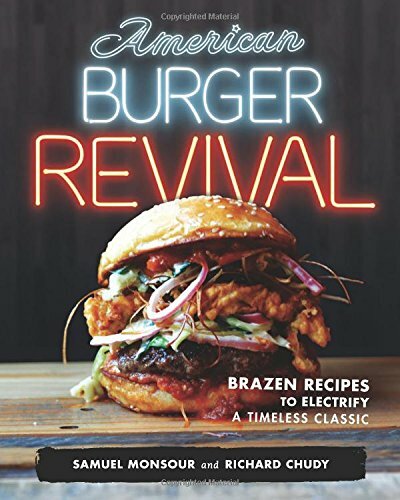 This article is full of great advice and delicious ideas that can only make burgers taste that much more delicious. Sometimes the same old combinations become boring and we need something new to keep our meals interesting, especially when we are serving to children. Thanks for this. Thanks om, glad you found the ideas interesting. I don’t know if it’s just me but I don’t really eat burgers all that much when autumn or winter come around. I mostly eat them whenever it’s warm outside, but that might just be a subconcious thing. Thank you for the detailed guide, I really appreciate the time you took to write this! I’ve read it all and I got some pretty good new ideas. It’s definately a summertime grilling thing in our house… glad you found some new ideas to try out! These all look so amazing. I’m sick and tired of plain old red meat patties. 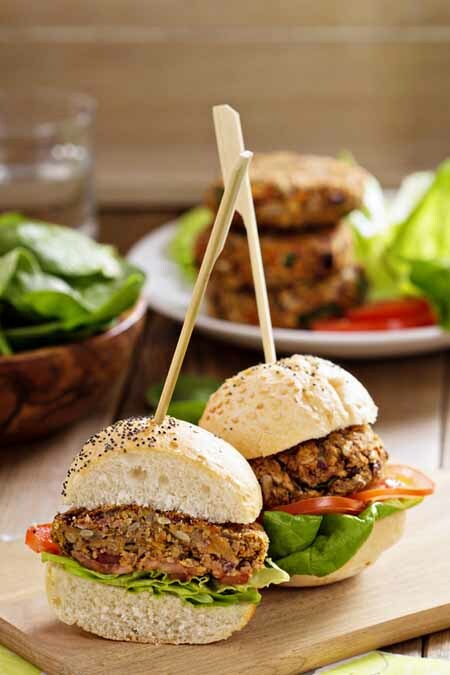 The salmon and bean burgers are great healthy alternatives, and the lamb, though unhealthy, looks absolutely mouthwatering. I can’t wait to put these on the grill! All of these burgers and options sound tasty. 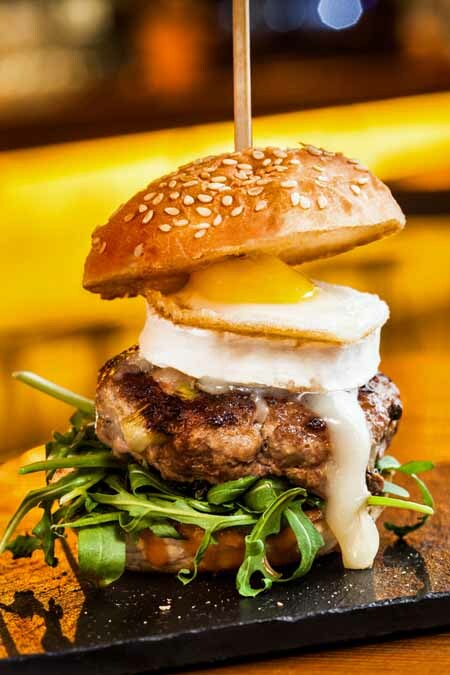 I once had one that contained an all-beef patty, an all-bacon (YES, bacon) patty, a grilled cheese sandwich, arugula, a quail egg, bone marrow butter, tomatoes, and cheese. I’m not making that up either. It was $20 at a restaurant as their monthly special. I think onions, guacamole, bacon, and the right cheese are necessary for every single concoction. Wow! No wonder it cost $20! But you didn’t mention if your enjoyed it?! All I can say is YUMMMM! Burgers are a summer staple in our house. The whole family loves to make their own. The greek option you’ve given is one that has never crossed my mind and I CANNOT wait to try it! Thanks for the ideas! You’re very welcome cbrain5, I do hope you and your family enjoy the Greek theme! Thanks for your comments nightwind. 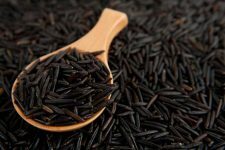 It is nice to step out of the same-old, same-old routine every once in a while, and I think a lot of people will use the nutritional info for healthy choices – if it’s readily available. The fetziki sauce is very flavorful as well as being relatively low in calories – and that’s a winning combo on my patties! Now I want a grilled hamburger. All those burger pictures was to much to handle. I put my ground chuck in a bowl I put in all kinds of seasoning chopped onion, and bbq sauce. I patty them up not to thick, but not to thin. My husband grills them up just right too. I don’t care how a person makes a burger as long as they are grilled, and juicy I am going to love them. Grilled and juicy, pretty hard to go wrong with that combo kk! Thanks for your comments. 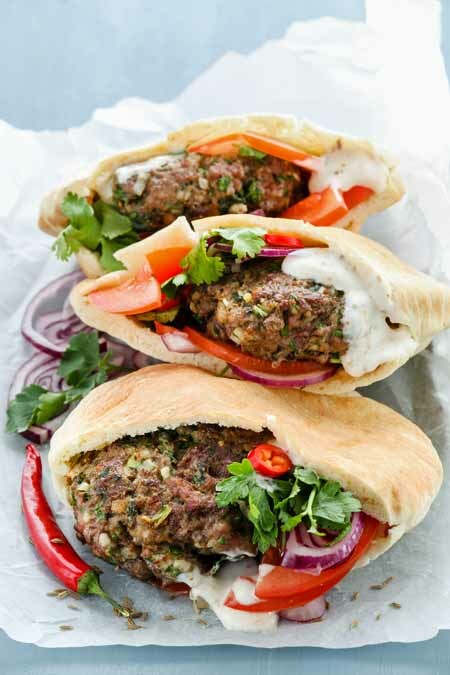 You’re right 5upremefx, it is tzatziki, but with Feta cheese added – and great with lamb. Or an Onassis style pizza! Let us know what you think of the lamb burger after you’ve tried them out. You’re welcome Yosh. 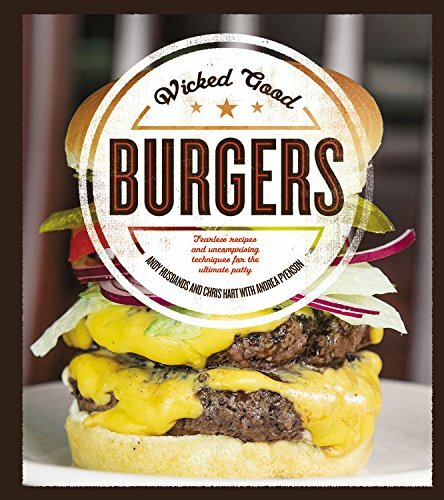 After a couple of new recipes, you’ll be a burger guru! Let us know which are your favorites. The sesame seed bun looks good. I never thought to try something like that. You have to use the right type of meat too or the burger won’t come out tasting very good in texture. You’re right harpazo, the right cut is very important for the best taste… thanks for your comments. You are killing me here, Lorna. I have been craving a great burger. I think I might have drooled a little bit over that oozing blue concoction. Yum! I’m doing low carbs, so I’ll have to skip the bun, but it looks so good that I don’t even think I’ll miss it. In fact, all of these look good. I’ll be giving some of them a try. They are so much better when homemade that I rarely go out for one any more. Mmmmm… I know what I’m having for lunch! Lol! The oozing blue concoction is to die for Zyni, and I usually have mine on a bed of lettuce, tomatoes and thinly sliced onion, sans bun – with no flavor loss at all. Enjoy your burger! Wow! These burgers look so good I feel like making them right now. I will have to wait until later, but I fully intend to make burgers today. Thank you for these delicious burger recipe ideas. I am going to really enjoy them. I must admit I really love burgers, over the years I have enjoyed beef and chicken burgers as well as vegetarian varieties. I have never made my own veggie burger since I did not really know how to make them, so thank you for the recipe. I knew chickpeas where a great way to make vegetarian burger patties, but never knew you could add quinoa, I really must try this! I had veggie burgers before that had pumpkin puree in them, which is also lovely. For a varietie of the beef burger I like it mixed with lots of veggies and served in a pitta bread with some goat cheese. The chickpeas work well as a binder, and the quinoa adds some nice texture valedevento. It would be very good with your pita pocket and goat cheese! I haven’t had a burger in so long, and it’s probably best not to look at these articles while hungry! The turkey burger looks delicious, as well as the sesame seed bun. 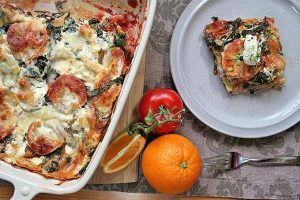 These recipes look amazing; I’m definitely going to have to try and recreate them sometime! No article on this site has made me drool more than this one… seriously, it is 8am here and I am ready to fire up the grill! I have a hard time cooking burgers because I try to avoid unhealthy food, so when I make them, I just use a very general recipe with just salt and pepper. My problem is i think if I tried all these exotic recipes, I would be tempted into eating red meat more often than I should. But wow, there is nothing more beautiful than a big thick burger dripping with melted cheese. Oh to be young again. Lol! Nothing beats the drool test! But I know what you’re saying about cutting back on the red meat Azrile… I’ll limit myself to only one or two of them over the summer, and more often opt for the healthier salmon and turkey varieties – they’re pretty good at taking care of the drool! I don’t eat a lot of red meat, but I do love a good burger, with all the ‘fixin’s’ so to speak! The blue stilton and sirloin burger looks to die for! I also love veggie burgers as you are getting all the fun of the burger, but some goodness in there too! I just made the Stilton and sirloin burgers last weekend ukfoodiegirl, and they have a flavor that out of this world! Not as much fun as the veggie version, but worth it! Thanks for your thoughts. Those are great Buger facts, I had no idea that there were actually so many factors that can affect the burgers by themselves in so many ways. And also, there are so many meat variations when it comes to burgers! I had no idea that lamb burgers existed, and I love that it has a Fetziki sauce on it, I love that sauce! Oh my gosh, those burgers look sooo good. 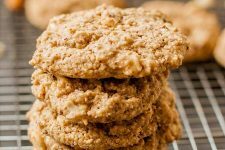 They are visually appealing and appetizing and I bet they taste even better than they look! I especially like the bean burger. That’s a really healthy alternative to the regular steak patties. The bean patties are pretty good clair, and hard to beat health-wise! I do like your advice to avoid pressing the patties as it will leave it dry and tasteless. That is something I will be sure to remember as that should help me make the perfect cheeseburger. As of now, I shall be roaming around the States and tasting some of the best cheeseburgers they can offer so that I can find the perfect recipe for mine. Thanks! Hope you succeed in your quest for the perfect cheeseburger Jeremy!